This is an excellent treat for both adults and children. 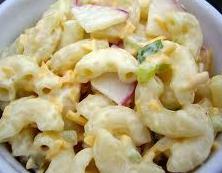 Macaroni serves as amazing appetizer and it can be relished during the summer and winter months. The ingredients required for this dish are a pound of macaroni (boiled and rinsed) onions, celery stalks and cherry tomatoes. The dish is extremely easy to prepare as all you need to do is mix all the ingredients together and add a dash of olive oil and some mozzarella cheese to it for the timeless taste. The dish can be stuffed in sandwiches or you can just eat it as an appetizer.